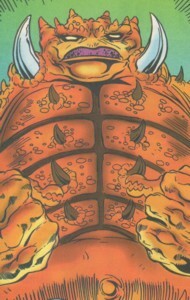 Powers/Abilities: He was a giant demon capable to swallow a being of Deacon Frost's size in one piece. His demonic powers granted him immortality, superhuman strength (level unknown) and an endless hunger for souls. He seemingly also had the ability to empower others with demonic abilities (see the Frost doppelganger). (Blade: V-H I#6-8 (fb) - BTS) - Nezaral, the Dark Agent of Chthon, was involved in the Deacon Frost doppelanger's change into a more powerful being. (Blade: V-H I#8) - Summoned to Earth by the Deacon Frost doppelganger the demon Nezaral took his payment and devoured Deacon Frost who laid within the Circle of Cold Flame where the sacrifice had to lie. Nezaral vanished again with three loud laughs after the doppelganger was devoured. Comments: Created by Ian Edginton (writer), Douglas Wheatley (pencils), Steve Moncuse (inks). Nezaral was never fully seen, but with all the spikes on his back and neck he looked a little bit like an Ankylosaurus. 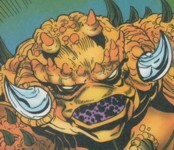 Maybe he was and Set turned him into a demon, but Nezaral then became an agent of Chthon because Chthon was nicer or gave him a better contract (with a good dental plan and 5 weeks vacation on Monster Island). The boy that the false Frost wanted to sacrifice could be the son of the man responsible for the Frost doppelanger's resurrection. In Blade: V-H I#8 Frost told the boy that he would soon see his dad like promised, but that it would be in hell. 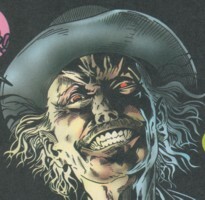 The Frost doppelganger's demonic look reminded me of the monster in "Jeepers Creepers" (2001), but Blade was written a few years before that movie came out. No connection there AFAIK. The amulet used to summon Nezaral could be connected to the first Roman emperor Augustus (Gaius Iulius Caesar Octavianus). Another possibility would be a connection to Pope Johannes XII. (Octavian von Spoleto) or Pope Viktor IV. (Octaviano de Montecello). I didn't find any other famous people that could be connected to such a thing, but there are sure others that could be the original owner and name giver of that amulet. The Frost doppelganger had vampiric abilities including turning into mist, talons, fangs and bloodlust, but none of their weaknesses except for sunlight. He hid his demonic nature behind a form resembling Deacon Frost. He could skin himself to reveal his true nature at any time. In his demonic form he possessed wings that enabled him to fly. His horns and wings could be drawn in. He was able to transform into a pack of rats and reform himself. His upper body could be opened to reveal a giant mouth with sharp teeth. Frost could release tentacles from this mouth that drew victims inside him. He could also release a swarm of insects from this cavity. Smaller, fairy-like demons accompanied the Frost doppelganger on at least one occasion. (Blade: Crescent City Blues (fb) - BTS) - Deacon Frost created the doppelganger by combining science and magic. (Blade: V-H I#7 (fb) - BTS) - A human resurrected the doppelganger with black magic and thought he could tame him as an occult familiar. (Blade: V-H I#8 (fb) - BTS) - The human was sacrificed to demons by Frost to finish the Rite of Deification which made Frost immune to stakes and swords. (Blade: V-H I#6 (fb) - BTS) - He abducted a young boy whose pure soul he needed later as a sacrifice. (Blade: V-H I#7-8 (fb) - BTS) - Frost began his search for the Amulet of Octaviano he required for the second rite to gain immunity against sunlight and to become unstoppable. (Blade: V-H I#6) - Frost drove to Absolution in Nevada and stopped at a diner for a snack. He killed the guests and the waitress and then left with a few leftovers (think intestines or something like that) for later. Back in his car he gave the leftovers to the boy on his backseat and drove away. (Blade: V-H I#7) - Frost went to the Chiaroscuro in New York where the amulet he sought was hidden. He beat up the Chiaroscuro's guardian Bible John together with small demons, but John didn't reveal the amulet's location to Frost. A psychic cry for help brought Blade to the Chiaroscuro who attacked his supposed "creator". The imposter played his role as Frost and taunted Blade with his mothers' death among other things and claimed that he had become more than a vampire. Blade drove his sword through Frost's heart but Frost turned into a pack of rats and then realigned himself as a dark shadowy being before evolving into his new, true demonic form. His new appetite for body and soul and Blade had a hard time fighting him. After taking a hard right Frost saw the amulet he came for and flew away with it. (Blade: V-H I#8) - Frost brought the boy to a slaughterhouse somewhere in New York and hypnotized him. Frost then built the Circle of Cold Flame and began the summoning of his master Nezaral. Morbius saved the boy before Frost could stab him with his dagger. Frost fought Blade and Morbius and once again skinned himself to fight in new, demonic form. He tossed Morbius to the ground and sent a swarm of insects after Blade. The sigils within the Circle of Cold Fire began to burn and Frost knew that he had to ready the boy as payment for Nezaral. Blade came back, knocked Frost to the ground and nailed him to the floor with his sword. Nezaral appeared, mistook the false Frost as the sacrifice because he laid in the within the Circle of Cold Flame and devoured him. It was an item of unknown origin that was seemingly for a long time in the possession of the Cathari. It was possibly stashed in the Chiaroscuro in Calcutta and was brought to the new Chiaroscuro in New York after the old Chiaroscuro's destruction. The false Frost beat up Bible John who didn't tell him were it was hidden. Later Frost found it accidentally while fighting Blade and fled with it as soon as he got his hands on it. The Frost doppelganger then used it as part of the "Rite of Summoning" to bring Nezaral to Earth.